Bernadette Berrios goes over the edge! Wanted: 40 or so big-hearted men and women compassionate about providing local youth opportunities to learn new life skills and set goals for their future! Why: To personally show our local youth that we can all overcome our challenges and face our fears to reach success! On September 21, Bethany Children’s Home is taking its fundraising to new heights. Specifically, the eighteen-story historic Abraham Lincoln Apartment Building in Reading, PA. Through a partnership with Over The Edge Global, this long-standing youth organization will see participants rappel from the top of the Abe Lincoln down 12 stories to the parking garage roof below. To date, 40 community members have signed up to participate, with about 30 more slots still available. In all, Bethany hopes to generate $125,000 through the high-reaching fundraiser made possible through the generosity of the Shuman Development Group and VA Productions. 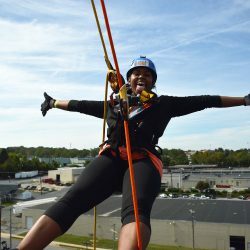 Over the past decade, Over the Edge has hosted more than 700 successful rappelling events, raising more than $70 million for nonprofit partners. Established in 1863, Bethany Children’s Home provides a safe place of nurture, protection, and supportive care to aid our residents in their self-understanding, growth, and healing toward a brighter, healthier future. “If you can take an hour to face your fear of going over the edge, you can help our kids overcome the challenges they face daily and begin their healing process”, said Development Director, Meggan Kerber. Those who want to become an Over the Edge fundraiser can call 610-589-6828 or go to www.becomeadedger.com. For more information on Bethany and Over the Edge, go to www.bethanyhome.org.